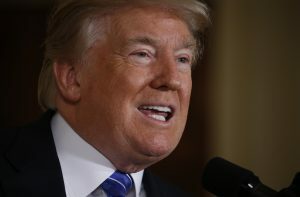 WASHINGTON — President Donald Trump unleashed a series of tweets Monday in which he tried to place the blame for Russian meddling in U.S. politics and deflect charges of obstruction and collusion onto former President Barack Obama. Trump, who has a long history of deflecting criticism from himself to others, seemed to be trying to redefine what it means to collude or obstruct as he pushed back against an investigation into whether Trump’s own team colluded with Russian officials during the campaign and transition. Trump appeared to be referencing a Washington Post story about the Obama administration’s handling of Russia’s attempts to influence voters in which some officials questioned whether the president had done enough to stop Russian meddling in the 2016 election. Obama ordered a review of Russia’s actions and imposed new sanctions after the election. As president, Trump has frequently disparaged the Russia probe as a “witch hunt” promoted by Democrats. Monday’s tweets appeared aimed at delegitimizing some of the allegations frequently hurled at him by his political opponents. During his presidential campaign, Trump frequently sought to muddy some of the criticism raised by his opponents. When rival Clinton argued he was unfit to hold office, Trump pointed to Sen. Bernie Sanders’ primary campaign assertions that Clinton lacked judgment. When Trump faced scrutiny over his vulgar comments in a 2005 video, he sought to revive allegations of sexual impropriety against former President Bill Clinton. Wayne Fields, a Washington University professor who has studied political rhetoric, said Trump appeared to be co-opting terms like collusion and obstruction as part of a larger strategy to “invalidate” some of the arguments made against him. “You take words and you do everything you can to make them meaningless. You take any kind of precision out of public discourse so it can’t be used against you,” Fields said. Peter Henning, a law professor at Wayne State University in Detroit who has written about public corruption, said Trump appeared to be taking the term “obstruction,” which means impeding an investigation, and applying it to a decision by his predecessor not to pursue an investigation as vigorously as possible. “Inaction is not an obstruction, but of course it has some potency as a political attack,” Henning said. Asked about the comments, White House press secretary Sean Spicer told reporters there were “some serious questions” about what the Obama administration “did or did not do in terms of acting” after evidence of Russian meddling surfaced during the campaign.